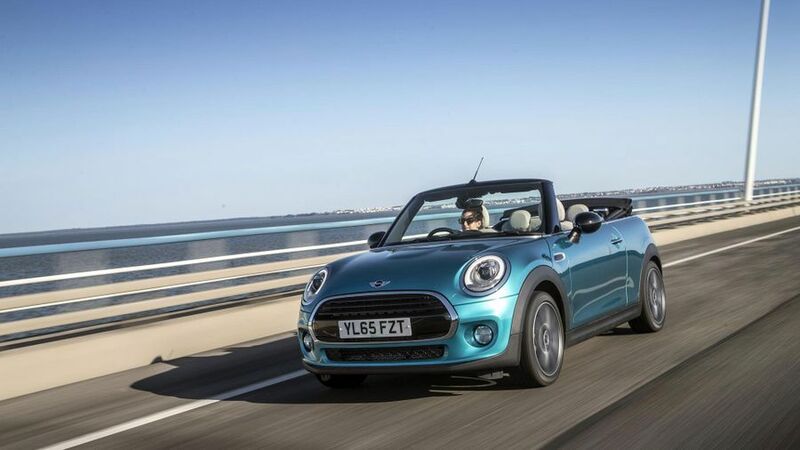 The Mini Convertible is a fine addition to the range. It drives better than previous versions, looks good on the outside and feels premium on the inside. The Cooper S is a hoot to drive, too, but all the engines feel gutsy, while bringing pleasingly low running costs. It is even a bit more practical than before, so you can now fit three friends in for a ride, too. 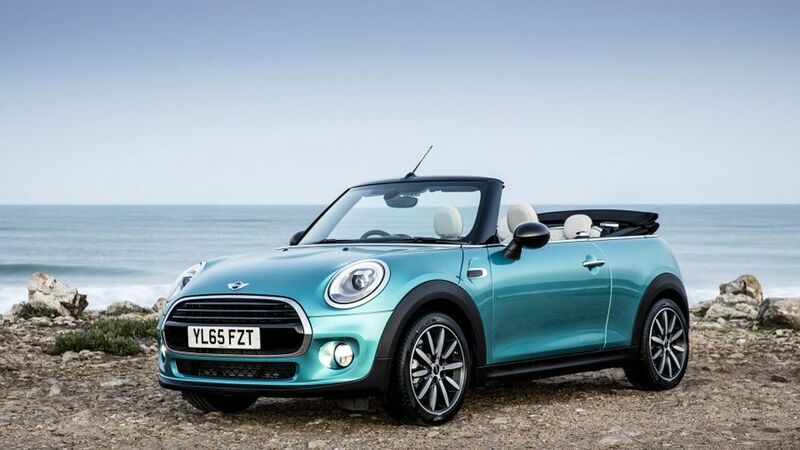 Interested in buying a MINI Convertible? Convertible owners want to look good whether the roof is up or down – and, fortunately, the latest Mini look suits the new convertible rather well. While the new Clubman seems a bit ungainly, the larger proportions of the chassis underneath (which is both wider and longer than on previous generations) give this drop-top a more aggressive and sportier look than before. The front of the car is saturated with styling details, with a chrome-ringed oval grille, wide air intake, fog lights and (on the Cooper S) a bonnet scoop all crammed onto the short nose. By contrast, the rest of the car is a lot less fussy, with clean lines giving it a striking silhouette with the top down. The cloth roof still sits folded behind the rear seats rather than stowing away completely like it does in the two-seat Mazda MX-5, but it sticks out less prominently. As with every modern Mini, you get to choose from a wide variety of bright colours for the paintwork; there's lots of chrome trim around the lights and grilles; and, alloy wheels are standard. The Cooper S models have bigger wheels and a sportier design, while the John Cooper Works model has bonnet stripes, lowered suspension and beefier-looking brakes. A first for the Mini convertible, this version has the option of a printed Union Jack for the cloth roof and there are hundreds of other ways to personalise the car via the lengthy options list. While the cabin of the previous Mini convertible was full of retro touches that were meant to give you a warm and fuzzy feeling about the cars from the sixties, this latest one feels considerably more grown-up. Interior quality has improved steadily, and the layout is a bit more user-friendly, with both the rev counter and speedo now sat directly in front of the driver. Run your fingers over the switchgear and most of it feels sturdier than what you’d find in a Fiat 500 C or DS 3 Cabrio – but its not quite as robust or logical to use as an Audi A3 Convertible (which admittedly is dearer and from the class above) even if it does a greater sense of fun. The driving position is set nice and low to the floor, the seats are smart and (on the Cooper S at least) fairly supportive. However, the excellent view down the bonnet just highlights how poor the visibility is when reversing, with the folded roof blocking much of your view when down, and just a small rear window to peer through when it's up. Cooper S models come with a standard 8.8-inch XL screen for the media system, which is bright, clear, and easy to use, and has the same excellent software and layout as the latest BMW models. Mini has listened to its customer feedback with this car and desperately tried to cram a bit more practicality into this convertible, both for passengers and luggage. 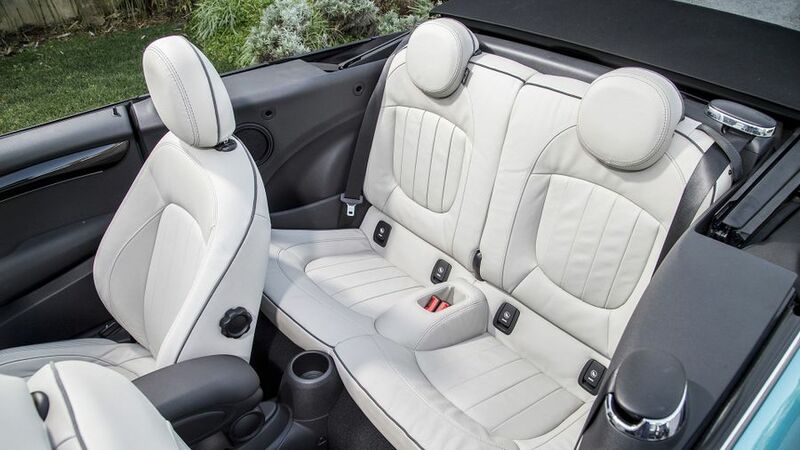 Those sat in the front now have a lot more head-, shoulder-, and elbow-room to stretch out in, and taller drivers will have a lot more space in the Mini than they’d get in a Mazda MX-5. Previously, the back seats were so restrictively tight on space that their main function was as an overflow for any bags that were too large for the boot. Now, though, you can just about squeeze adults into them for short journeys – even if rear legroom is still at a premium. The boot is now larger, too, providing 160 litres of space with the roof down, and 215 with it up. A quick survey of the rivals show that this is still a handful less than you’ll find in a DS 3 Cabrio or a VW Beetle Cabriolet, but the Mini does have a couple of neat tricks to make life easier. A pair of handles in the boot fold out and let you pop the top section of the trunk open, which widens the opening enough to get bulky suitcases inside and improve access. Still, the load bay is an awkward shape and its uneven floor means the Mini convertible only really has room for a few shopping bags or a pair of soft holdalls. 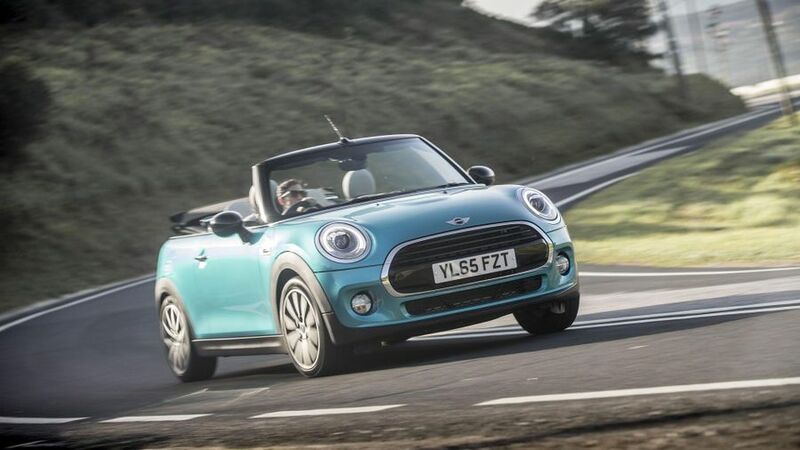 Mini has managed to strike a good balance between driving fun and passenger comfort in the Convertible, despite the extra weight it carries over the hatchback. Despite losing its roof, it feels pretty stiff, too – with much less flex in the body than many of its rivals. You can still feel the car shimmy around over really bumpy roads, but it's rare for it to get unsettled. Large crests are nicely absorbed by the suspension, but smaller imperfections will still send a judder through the wheels and up into the cabin, even with optional adaptive dampers. Quick steering and grippy front tyres mean that the Mini feels darty and agile on twisty roads, with little body lean, although if you are too eager with the throttle in the Cooper S, it will try and tug you across cambers in the road, so you have to be alert when driving it quickly. It feels fun, but is probably a tad less relaxing than its other, less sporty competitors. We tried both petrol versions of the Mini Convertible so far, the Cooper and the Cooper S. They feel surprisingly similar in terms of power delivery, as both engines use turbochargers, which means decent in-gear acceleration and a wide spread of grunt across the rev range. It’s only on the motorway, or when overtaking, that the smaller 1.5-litre three-cylinder unit in the Cooper feels a bit short of puff. 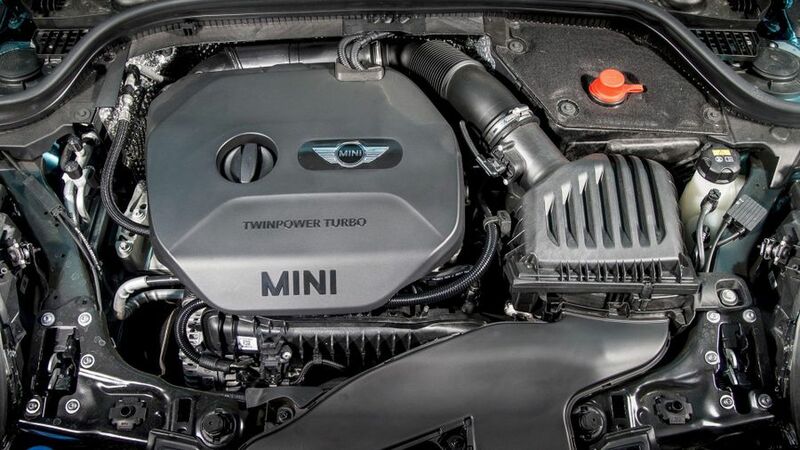 We’ve tried the more modest petrol versions of the Mini Convertible, the Cooper and the Cooper S. They feel surprisingly similar in terms of power delivery, as both engines use turbochargers, which means decent in-gear acceleration and a wide spread of grunt across the rev range. It’s only on the motorway, or when overtaking, that the smaller 1.5-litre three-cylinder unit in the Cooper feels a bit short of puff. The Cooper S feels like it has a bit more sparkle, but not as much as with the Mini Cooper S Hatch, and it doesn’t feel quite so much like a hot hatch. We haven’t driven the fastest version yet – the John Cooper Works – nor have we sampled the only diesel on offer, the Cooper D.
Fans of automatic gearboxes can specify a seven-speed twin-clutch with the more modest versions, while the more powerful ones can be had with an eight-speeder. Both could be smoother (the former is better than the latter on that score) and have a strange reluctance to change down as you pull up to a standstill, causing some shudders through the car, but otherwise, they swap around their gears quickly and effectively. Even so, unless you really can’t bear the thought of pumping a clutch pedal, we’d stick with sweet-shifting manual six-speeder; its short-throw-action and precise weighting are beautifully synchronised and wonderfully engaging. Refinement is pretty good roof up or down, but those in the back will probably prefer life with the roof in place, as things can get quite blustery in the second row. And, like with other Minis, road rumble from the wide tyres is a constant presence in the cabin once you’re going above 50mph, especially on rough roads. The majority of Mini Convertibles are petrol-powered, but if you want the cheapest version to run then the Cooper D is probably your best bet. It does cost more to buy initially than the Cooper, but with CO2 emissions of 100g/km and official combined economy of 74.3mpg it’ll be a cheaper company car, and require fewer fill ups and less road tax as a private buy. The petrol model doesn’t fare too badly, though, with high-fifties MPG and CO2 emissions of 114g/km. Naturally, automatic versions are a little thirstier, while picking the punchier Cooper S will also add a chunk to the price, and to your tax bill. Premium pricing means that the Mini Convertible does look expensive, particularly after adding a few options. However, Minis are also some of the most highly prized buys on the second hand market, so the Convertible should hold its value really well, especially compared to rivals from Fiat and DS. All versions come with a three-year, unlimited mileage warranty, but you can extend this to five-year cover for a price. Servicing costs at main dealers will be a little above average for the class, but Mini offers some excellent value all-inclusive servicing plans to cover the first five years of ownership. Look at the reliability data on previous Mini Convertibles, and the chances are you’ll be pretty underwhelmed. Scores for most of the previous versions have been a bit lower than average according to Warranty Direct’s Reliability Index, as has the score for the Mini brand overall. We’d recommend you take Mini up on the offer of the Mini TLC servicing packages (98% of buyers are expected to), which covers the first few years of servicing for a nominal one-off fee. Having said that, quality has certainly improved for this all-new generation, and the interior feels far more robust than before, which should hopefully be a sign that it’ll last a bit longer and stand up to more wear-and-tear than the previous version. The engines are all featured in the hatchback, which went on sale over a year earlier, so you would expect any mechanical kinks to have been ironed out by now. Still, if you want a truly bomb-proof car to enjoy the sunshine in, then the Mazda MX-5 has a far better track record than the Mini. Six-airbags, traction and stability controls, reversing sensors and a parking camera, plus a category 1 Thatcham alarm system, are all standard fit on the Convertible, which is a pretty good starting base for keeping you as safe as possible. A set of pop-up roll-over hoops are hidden behind the roof mechanism, but will protect you and your passengers in case the car does flip over. Some choice safety options include a head-up display, so there is no need to take your eyes off the road, brighter adaptive LED headlights, and active cruise control. However, some of the latest active safety systems are missing, and as a result the standard three-door hatchback got a score of four out of five stars from testing body Euro NCAP. We would expect the Convertible to return a similar score, which is decent, but not class-best. Traditionally, this has been a weak point for Mini, as with the previous models you often needed to shell out at least a couple of grand to get a car that felt like it had the spec list to match the premium image. That does seem to be changing a little, though, with every version of this car coming with air-conditioning, Bluetooth, reversing sensors, DAB radio, and a parking camera. Still, climate and cruise control, heated seats, a multi-function steering wheel, sat-nav are all extra. 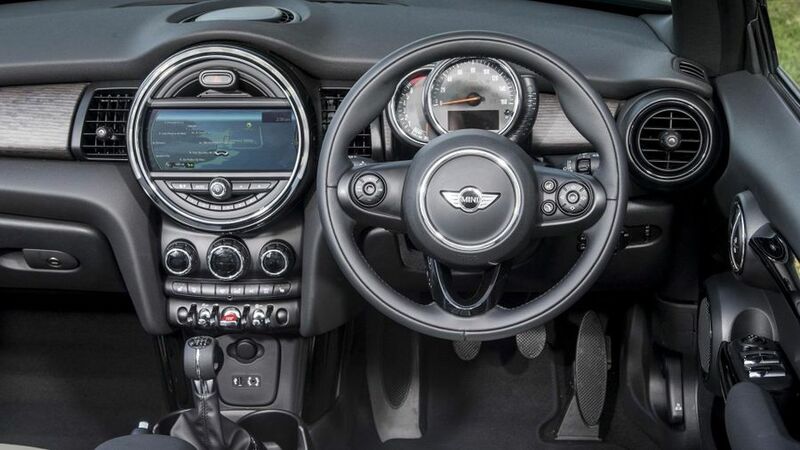 The Cooper S has a more generous amount of kit, with the larger media screen, cruise control, and bigger alloy wheels. The most effective way to add extra equipment is to pick one of the packs available, which bundle lots of desirable gadgets together. The Chili pack is very popular, and the Media pack is also worth considering, but both cost a fair amount, and while they save you money versus picking the options separately, it would be nice if the brand was a little more generous in the first place, particularly on the pricier models. If you want a good-looking Convertible that is also cheap to run, fun to drive and nicely built, then the Mini will deliver on all those counts. It feels like a higher-quality item than the car it replaces and is much better to drive, too, with decent ride comfort and quick, perky engines. The image (and the pricing) won’t appeal to everyone, though, and for those who care less about the way a car drives, cheaper alternatives from DS and Fiat are probably better value.